Activists in Iraqi Kurdistan Call for Protests Tomorrow: Stop Execution of Habibollah Latifi! A rally will be held December 25th in Suleimaniah, a city in Iraqi Kurdistan, to protest Habibollah Latifi’s imminent execution. Rawa News: A group of Kurdish political and civil activists, human rights activists and journalists have issued a statement asking people of Kurdistan to take part tomorrow in a protest at Freedom Park in the city of Suleimaniah to protest the imminent execution of Habibollah Latifi. The gathering will be held at 1:00pm, Iraqi Kurdistan time. The participants will include human rights and civil activists, and Iranian Kurdish political parties. Iranian judicial authorities informed Habibollah Latifi’s lawyer, Saleh Nikbakht, on Thursday that his client will be executed on December 26th. Amnesty International, the International Campaign for Human Rights in Iran, and global figures like Noam Chomsky have protested against the imminent execution. 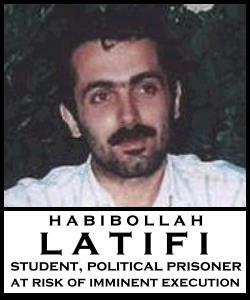 Habibollah Latifi was arrested on October 23, 2007. He was held four months in solitary confinement while subjected to severe torture by Ministry of Intelligence interrogators. Latifi was tried on the charge of “acting against national security and the regime” on June 30, 2008 in a process that lasted only a few minutes, without the presence of his family, in branch 1 of the Sanandaj (the capital of the Kurdistan province) Revolutionary Court. Judge Hassan Babaei, presiding over the case, cited verse 33 of a chapter entitled Maedeh in the Qur’an; articles 1, 3, and 5 of Chapter 6 of Tahrir ol-Masael, a book written by Ayatollah Khomeini; and sections 183, 186, 190, and 191 of the Islamic Penal code; to find Mr. Latifi guilty of Moharebeh (enmity with God), and sentenced him to death. MFI Letter-Writing Campaign: A Letter to Send for Habibollah Latifi; A Letter to Send for All of Us – ask foreign ministries and secretaries of state to suspend diplomatic relationships with the Islamic Republic of Iran for its ongoing crimes against humanity, including the pending execution of Habibollah Latifi, among thousands of others. جمعی از فعالان سیاسی و مدنی کرد، روزنامه نگاران و فعالان حقوق بشر در بیانیه ای از مردم کردستان خواسته اند که فردا در اعتراض به اعدام قریب الوقوع اعدام حبیب الله لطیفی در سکوی آزاد پارک آزادی این شهر تجمع خواهند کرد. این تجمع راس ساعت 1 بعد از ظهر به وقت کردستان عراق با حضور جمعی از فعالان مدنی و سیاسی، احزاب کرد کردستان ایران برگزار خواهد شد. مقامات قضایی عصر روز پنج شنبه 1 دیماه به صالح نیکبخت وکیل مدافع حبیب الله لطیفی پور گفته اند که حکم وی روز یکشنبه 5/10/89 به صورت قطعی به اجرا در خواهد آمد . سازمان عفو بین الملل، کمپین بین المللی حقوق بشر در ایران و برخی از شخصیت های جهانی از جمله نوام چامسکی به اجرای قریب الوقوع این حکم اعتراض کرده اند. حبیب‏الله لطیفی در تاریخ یکم آبان ماه ۱۳۸۶ بازداشت شد. وی ۴ ماه در زندان انفرادی تحت شکنجه‌ی شدید بازجویان اطلاعات مورد بازجویی قرار گرفت. لطیفی در تاریخ ۱۰ تیرماه ۱۳۸۷ طی دادگاهی چند دقیقه ای و بدون حضور خانواده، در شعبه ی اول دادگاه انقلاب اسلامی سنندج از سوی قاضی حسن بابایی به جرم اقدام علیه امنیت ملی و نظام با استناد به آیه ۳۳ سوره مائده (قرآن کریم) و استناد به مسائل یکم، سوم و پنجم از فصل ششم (حد محارب) جلد چهارم کتاب تحریر الوسیله امام خمینی و مواد ۱۸۳، ۱۸۶، ۱۹۰، ۱۹۱ قانون مجازات اسلامی، محارب اعلام شده و به اعدام محکوم شد .